These hockey drills help players develop the intermediate skills of more advanced passing, shooting, and scoring. Work on accuracy first, slowing the drills down, if necessary. Then begin to emphasize quickness and power. Passing skills make plays work. 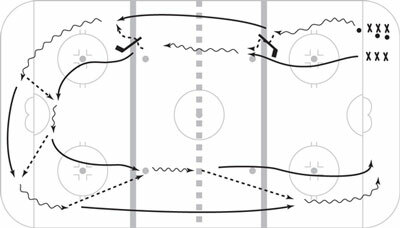 This drill lets players practice passing over an object on the ice and making long, hard passes when required. How it works: Have players skate in pairs around the ice surface. Place sticks on the ice at the blue lines, as illustrated in the figure below. As the skaters come to the sticks, one flips a pass over the stick to her partner who then carries it to the next stick where she flips the puck back to the original carrier. Have them make wrist passes as they go on either side of the net as indicated in the illustration. Coming back the other side of the ice, the puck carrier releases a snap pass as she reaches the bottom of the first circle, which should be received by her partner at the blue line. The new puck carrier skates to the center line and releases a snap pass, which her partner is to receive at the top of the next circle. After a few repeats, reverse direction of the drill. Coaching pointers: Make sure players open up the stick blade to make the flip pass and close the blade over the puck when making the snap pass. In both cases, be sure that the receiver presents his stick blade as a target. Eventually, help players incorporate the passes into a smooth skating rhythm, though initially they will likely need to glide to focus on making the passes. This is a good concentration passing and receiving drill that features quickness, accuracy, and timing. The figure-eight skater has to be sharp to receive and complete all the passes, while his stationary partner has to have good timing with his passes. The drill also works on footwork and pivoting skills. How it works: Have players work in pairs. Place two pylons or gloves six feet apart. The first player stands with a puck between and in front of the pylons. The second player skates a figure eight around the pylons, pivoting so that he always faces the first player. This skater keeps his stick on the ice as he skates so that he can receive and return ten passes from the first player as he enters the center of the figure eight. See the figure below for the drill pattern. Have players switch positions after ten passes. Coaches can specify or mix passing requirements, such as forehand wrist pass, backhand wrist pass, or flip pass. Coaching pointers: Help the stationary players focus on timing their passes to meet a moving target. Check that the figure-eight skater stays in proper skating posture throughout the drill. Make sure both players keep their sticks on the ice all the time. Confirm the mechanics of whichever pass you are using, especially the wrist action and location of puck release relative to their body. This scoring drill for shooters helps build confidence in players’ scoring ability. In addition, as a saves drill for goaltenders, this drill provides coaches with a clear opportunity to focus on save techniques. How it works: Using both end zones, have players pick their hot spot, which is their favorite scoring spot. Assign numbers to each player and have players shoot in sequence. See the figure below for an example. Go right to left (for the goaltender) one time and left to right the next round of shots. Coaches can specify the type of shot, such as a forehand wrist shot, backhand wrist shot, or snap shot. For slap shot practice, pick favorite long-shot hot spots. Coaching pointers: Time the shots so that the goaltenders can get in position and have a chance to make a save. Tell shooters to shoot to score as opposed to simply making the goalie move. Watch shooters’ and goaltenders’ techniques closely for an opportunity to provide improvement tips.